The fabrication of high-performance light detectors—important for computers and mobile devices—using graphene integrated onto a chip is reported in three independent studies published online this week in Nature Photonics. Dirk Englund and colleagues report an ultrafast graphene light detector that has a responsivity that is about 16 times greater than that of previous graphene light detectors over a broad bandwidth of 1,450–1,590 nm. Thomas Mueller and co-workers describe in a second paper a graphene light detector with a multigigahertz operation over a wide range (1,310–1,650 nm) that includes all the bands used by optical-fibre communication systems. 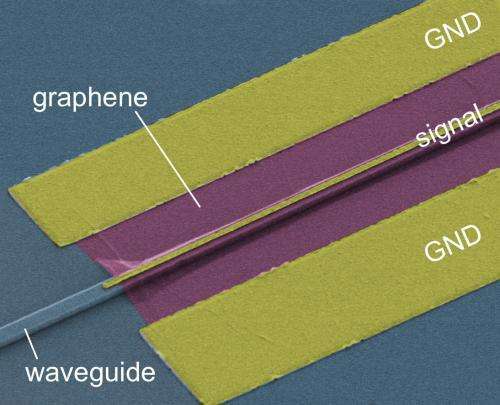 Its responsivity is approximately eight times higher than that of earlier graphene light detectors. In a final study, Xiaomu Wang and colleagues fabricate a high-responsivity graphene photodiode that operates at mid-infrared frequencies. Its potential applications include monitoring chemicals in the environment and on-chip infrared spectroscopy, which could be used for medical tests. The unique optical and electrical properties of graphene and the ability to create these detectors using existing fabrication technology for integrated circuits in digital devices makes it very likely that graphene will soon replace germanium and compound semiconductors in high-performance light detectors. These three studies therefore further highlight the exciting potential of graphene for optoelectronic devices.